What defines a great guesthouse? Is it the luxurious cotton sheets, goose down duvet and fluffy feather pillows that adorn the queen size ? Or the spacious en-suite bathroom? Or perhaps the presence of a professional chef, such as Lynn, who has catered for the most diverse and fascinating personalities, including the late Mr Nelson Mandela, Queen Elizabeth, Archbishop Desmond Tutu, The late Michael Jackson, various leaders of industry, ambassadors to the UN and other countries, prime ministers, presidents, and various master chefs from Europe? Maybe it’s that we are situated a short stroll away from the internationally famous and beautiful Kirstenbosch Botanical Gardens. 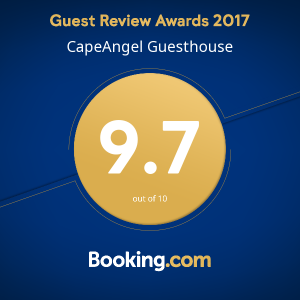 or within 15 minutes of Cape Town’s finest tourist attractions, including the City’s beautiful Table Mountain, the ever bustling Waterfront Development, and sporting stadiums? Perhaps for our many business guests it is the wireless internet service, the large undercover patio which is excellent for business meetings and functions? Don’t forget our sparkling saltwater pool, and wide range of holistic treatments and heavenly massages on offer. In short, yes, it is all of the above; but more importantly, it’s that we strive to understand our guests and go to all lengths to make them feel completely comfortable. For some that means rolling out the red carpet and making a fuss, while for other our discretion is all they ask.